The U.S. economy continues to do comparatively well, but there is more chatter in the background about a looming global recession. It began this summer, partly as a result of the speculations about a trade war between the United States and China. Recently, the tightening of monetary policy has been suggested to increase the recession risk. 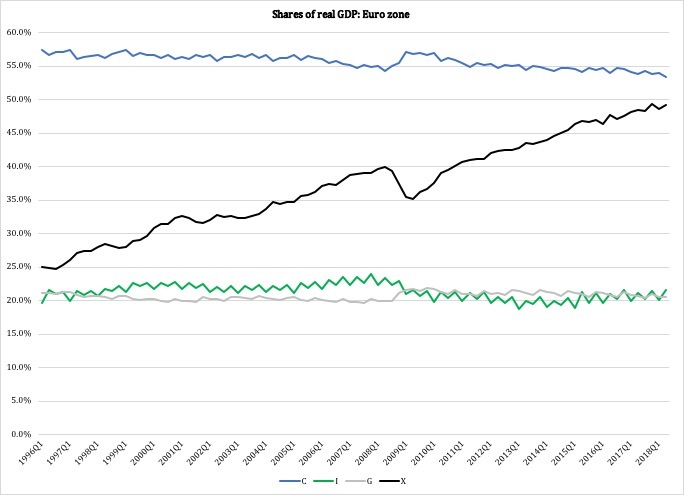 This is a point worth taking seriously, and the risk for a recession is reinforced by two variables that have not been given much attention in the media: Europe's growing dependency on exports, and America's return to trillion-dollar deficits. When these two variables are added to the already-existing threats to global economic growth, the longer-term outlook for the world's economy, and especially for the U.S. economy, is worrisome. Very soon, gross exports are going to be more important to the euro-zone economy than private consumption. This means, plainly, that the euro-zone economy will be using more of its resources to sell abroad than to satisfy the needs of its own markets. This may seem like a technical point, but it conveys a compelling message about the European economy. There is not enough purchasing power among European households to support its own economy. It is not that exports add demand to domestic absorption: according to Eurostat, the unemployment rate in the euro zone in the second quarter of this year was 8.3 percent. The U.S. economy, by contrast, has pushed its unemployment rate below four percent. In other words: exports are becoming increasingly important because Europeans do not have enough money to buy what their economy can produce. A major reason why European purchasing power is weak, is the high taxes needed to feed the continent's over-bloated welfare states. European governments tend to try to balance their budgets without giving up any of the welfare-state spending they have, other than what is necessary to fit that welfare state into the smaller shoes of a stagnant tax base. When stalwart defense of the welfare state is combined with unrelenting demands for a balanced budget, the result is a gradual upward pressure on taxes. The substantial rise in investments is actually not very dramatic. It correlates well with the growth in exports, suggesting that businesses in Europe invest increasingly for foreign markets, decreasingly for the domestic market. To this point, in Q2 2018 gross exports exceeded 50 percent of the German economy for the first time since Eurostat began reporting EU-wide national-accounts data in 1995. While Germany leads the trend, most of Europe is undergoing the same transformation from an economy geared for prosperity, to an economy geared for exports. As exports increase as share of GDP, while domestic demand is stagnant, the economy becomes increasingly vulnerable to transmission mechanisms from the global economy. Recessions spread faster, simply, making the next recession even more dangerous than the previous. The second variable that will exacerbate the next recession is government debt. 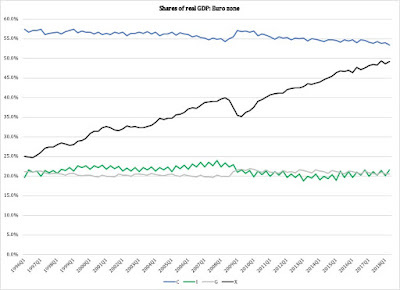 It is related to the first variable: without a big welfare state we would neither see a tax-driven stagnation of domestic spending nor have to worry about fiscal-panic reactions when tax revenue falls and interest rates rise. Yet that is precisely what we are looking at, come the next recession, but probably not on the same continents. While the Europeans are likely to experience a plunge in economic activity as demand for their exports tapers off, the brunt of the fiscal-panic effect will be taken by the U.S. economy. Most European countries run budget deficits, but the real worry is on the American side. The Trump administration, while having done much good for the economy, has also returned the federal deficit to a trillion-dollar deficit. At the same time, interest rates are rising, adding insult to injury as interest rates, i.e., the cost of rolling over the federal debt, creep upward. To be blunt: the United States cannot go into a recession with a budget that is $1 trillion in the hole without suffering some serious credit-related repercussions. The reaction from Congress will most likely be fiscal panic of the kind we saw erupt in Europe during the Great Recession. This, in turn, will accelerate the next recession; how far, is difficult to say at this point, but with weak state finances compounding the problem, it would be irresponsible to rule out a serious austerity-driven crisis. In short: because of the lack of attention to the long-term negative effects of welfare-state spending in Europe and in the United States, the next recession could be a very tough experience, not just for these two economies, but for the world as a whole.